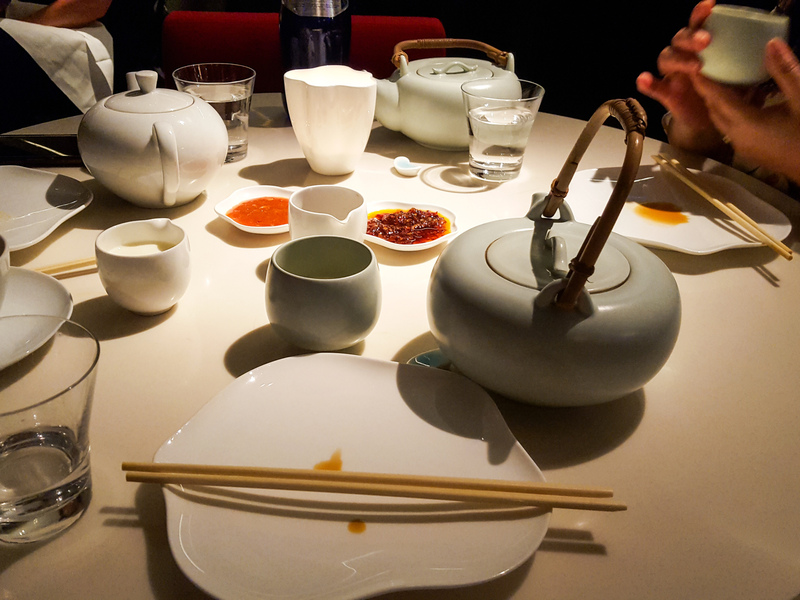 Yauatcha Soho – The Michelin Starred Experience! Yauatcha Soho, is a Michelin 1-starred Dim Sum tea house that is contemporary yet a casual tea house that offers an all-day dining experience. Which serves modern Cantonese cuisine and offers affordable luxury in the world of elegant food expression. Modern authenticity is at the roots of Yauatcha’s cuisine and service (and of course tea). The Chefs have taken recipes from all over China, and have used cooking methods true to a thousand of years of Chinese tradition, and infusing them with a modern sensibility. The result is an authentic Cantonese cooking with a contemporary flair – at once subtle and thrilling – and all made with the best ingredients. Yauatcha in Soho is one of our favourite Chinese restaurants in London. The quality of the food is amazing and the dim sum is just so darn good! We love coming here for tea and dinner. We are fairly often in Soho, be it for food or catch up with friends, it’s a popular area to go out. So of course, We have walked past the eye-catching glass-front of Yauatcha quite a few times. And how can you not notice it? The glass front literally draws you to come closer with their tempting selection of macaroons. When entering the Chinese dim sum teahouse, you will first see the patisserie counter on the right containing multiple rows of petits gateaux, macaroons and chocolates that combine classical European culinary techniques and Chinese cuisine. Seriously, we couldn’t stop walking up and down, contemplating which piece to try first. Once we were seated we ordered different green teas each (For the life of us, we forgot what we ordered) Nontheless, we ordered one of the best dishes is the Thai style chicken with onion, mango, papaya, chilli and coriander (泰式雞). Accompanied with Kung pao chicken with cashew nut (宮保雞丁) and Stir-fry scallop with lotus root (滑炒蓮香帶子) with steamed rice each. Though the best thing about Yauatcha has to be the desserts which take inspiration from authentic Chinese flavours. They are literally a piece of art by themselves. One of the favourite has to be the ‘Raspberry delice’ which is a rose-shaped sponge with raspberry mousse on the inside, madirofolo chocolate and lychee ice-cream. It was such a feast for the eyes and once sampled, convinced us that its taste was definitely up to par to its looks. Salted caramel, Jaffa, Lavender honey, Strawberry, Raspberry chocolate, Hazelnut praline, Sesame, Orange blossom, Matcha yuzu, Apricot pistachio, Violet, Popcorn, Passion fruit five spice, Coconut, Summer fruit mascarpone. Dining here is definitely worth the price, this place is great for a group catch-up or special occasion – We would highly recommend this to everyone! Just a stunning foodie experience! Scroll for some mouth-watering pics.